I went home to Malaysia for almost three months around Feb-April 2012. It was fun spending time with family. We celebrated my youngest brother's wedding, and welcome another bundle of joy in the family --- my first brother's youngest son, Timothy... it was such a good time back home that I almost feel bad coming back to the states. Couple of days ago she came home mentioning about a few mulberry trees at the roadside near our house, she said that it was full of ripe fruits, and was dropping all over on the ground.I guess she couldn't take it that the sweet little fruits goes wasted that way. 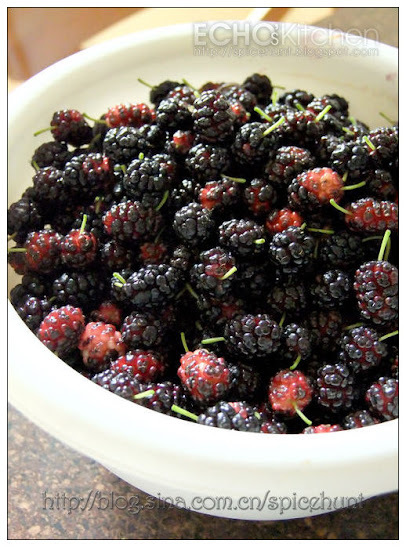 So one fine afternoon when I got up from my afternoon nap, there was this big bucket of mulberries sitting in the kitchen. 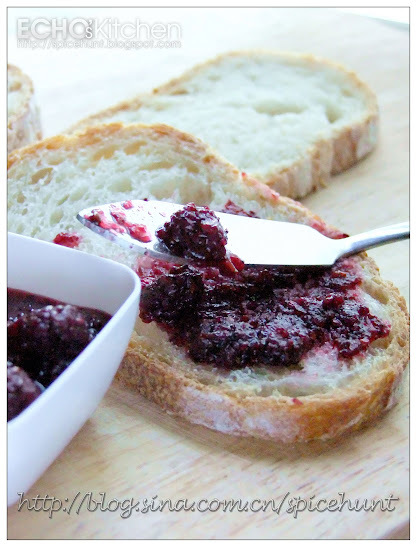 As we had just did our fruits and vegetable shopping the day before, I decided to make these berries into a fruit jam so that it stores better. Clean and remove stem of the berries, soaked in water with 1 tsp of salt to get rid of bugs, drained. Place the berries in a clay or glass cooker with lid, cover and simmer at low heat for about 10 minutes or until it becomes tender and juicy. 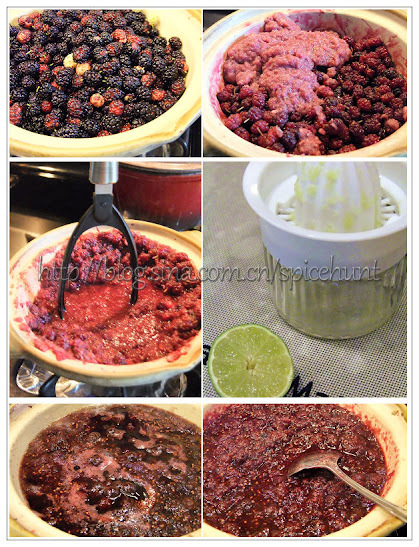 Scoop out about 1/3 of the berries and place it in a blender together with apple, blend into paste. Add the paste back to the cooker, mash everything a little using a spatula or potato masher. Add rock sugar and 1 tbsp of lime/lemon juice, continue cooking for 30-35 minutes, when the consistency thickened, it is done. Boil a clean jar in hot water to sanitize it, dry and keep aside. 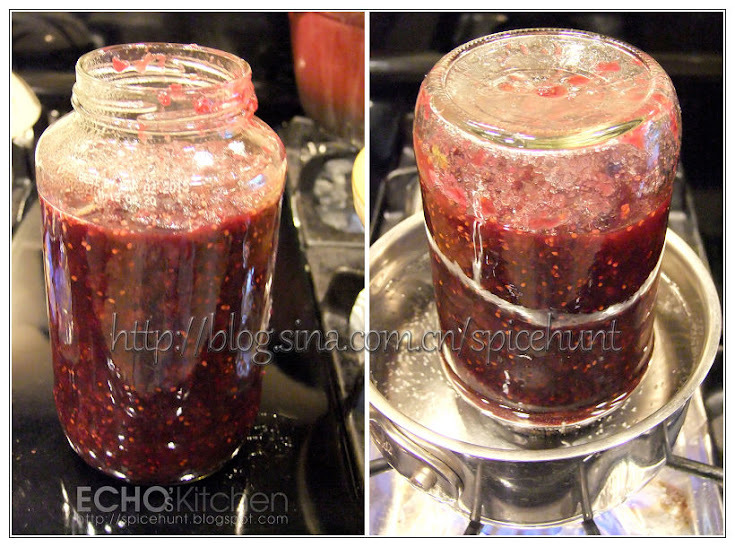 Pour the jam into jar while it is still hot. Cover lid tightly, turn it around. Bring 1/3 pot of water to boil, place the jar upside down in the boiling water and boil for 3-5 minutes, this is to vacuum out the air in jar and to sanitize the lid and outside of the jar. 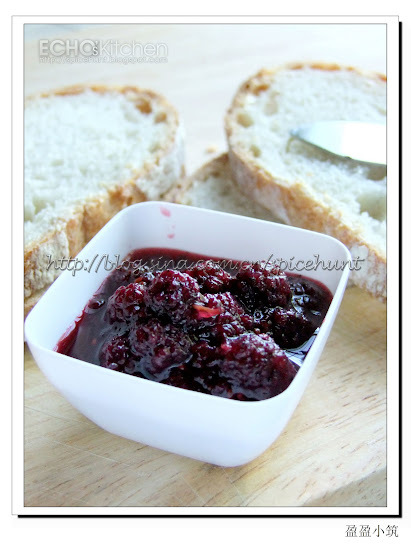 The jam could be stored in the fridge for 3 months without opening. Let me show you guys my little nephew Timmy boy.. he is now 3 months old and love to smile ! Ah... no wonder u had been missing.